PHUKET: Phuket Police are appealing to the public for help in identifying the body of a man found floating yesterday afternoon off Koh Racha Yai, an island about 25 kilometers south of Phuket. Lt Wuttiwat Liangboonjinda of the Phuket City Police said officers received a report from local fisherman who discovered the badly decomposed body floating in the sea. Police think the deceased man, dressed only in his underwear, may be a foreigner based on the heavy bone structure. Lt Wuttiwat described the body as that of a middle-aged male, about 172 centimeters tall, with a tattoo on the inside of his right forearm. Although officers could see that some form of tattoo was on the arm, they were unable to determine what it was an image of. “We believe the corpse had been in the water for several days because of the state of decay,” Lt Wuttiwat told the Phuket Gazette. However, he added that the body was unlikely to have been at sea for longer than 10 days. “We have checked with hotels and resorts on Koh Racha Yai, but none reported any missing guests. One possibility is that the man died elsewhere and drifted with the currents. “We have contacted every police station in Phuket, requesting that they check with the hotels and resorts in their area to see if they have any missing guests,” Lt Wuttiwat explained. 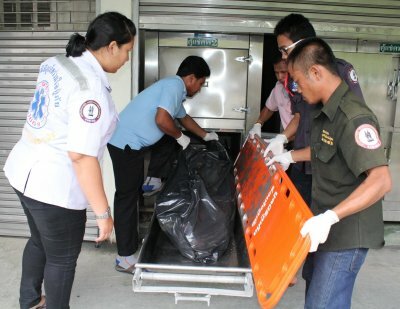 The unidentified body was sent to Vachira Phuket Hospital for medical examination. Any persons with information that may help identify the man are urged to call Phuket City Police Station at 076-212129.